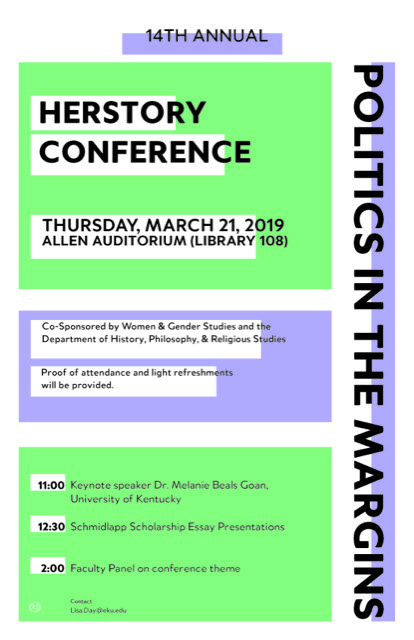 The 14th Annual Herstory Conference at EKU is co-sponsored by Women & Gender Studies and the Department of History, Philosophy, & Religious Studies. 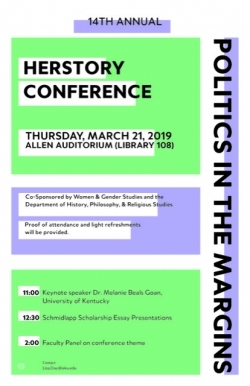 Date: Thursday, March 21, 2019. Dr. Melanie Beals Goan, "The Bitter End: Kentucky's Suffragists and the Nineteenth Amendment Victory"
1st place: Karly Lainhart, "Gender and the Reign of Cleopatra VII"
2nd place: Anna Nelson, "Follies of the Father"
3rd place: Kelsie Head, "The Mirabal Sisters: More Than Martyrs"